It seems like you can barely turn on the television these days without seeing an advertisement for medications and medical equipment. Equipment ads in particular often target seniors and inevitably include a promise that the company will deal directly with Medicare to get the product supplied with little or no cost to the consumer. While medical equipment helps countless people live fuller and more productive lives, the industry is a prime target for scammers. Power wheelchair scams and other equipment fraud operations allow scammers to profit at the expense of taxpayers and Medicare beneficiaries. Stopping these scams often requires beneficiaries and/or company insiders coming forward and sharing their knowledge. Medicare fraud lawyer Attorney Greg Brod protects the interests of these brave whistleblowers while working to stop equipment fraud and return money to the government. Wheelchair Scams: “The Poor Man’s Way In” to Medical Fraud A 2014 Washington Post report, carried online by The Fiscal Times, paints a picture of one power wheelchair scam based on testimony offered before a California court last summer. According to witness testimony, patient recruiters would call seniors and ask whether they had ever received a power wheelchair through Medicare. If the answer was “no,” the recruiter would attempt to get the person to agree to come to a medical office and get a prescription for a power wheelchair. Whether the patient truly needed the expensive equipment was all but irrelevant. One Medicare beneficiary testified that he told them he did not need a power wheelchair but that the company insisted they were giving away the chairs or free. Wheelchair schemes date back to at least the mid-’90s. The Post calls the operations “the poor man’s way in, an entry-level fraud that didn’t require a medical degree or a hospital.” Equipment fraud scammers bill Medicare for chairs and other equipment that is not medically indicated and pocket the large price markup. In the scheme underlying the above-mentioned court inquiry, recruiters were paid $800 for each time a (usually bogus) prescription was written and a chair ordered. The California-based scam billed Medicare for some 1,000 power chairs, a medium-sized operation in the world of Medicare equipment fraud. 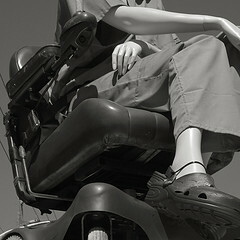 Per The Post, Medicare has spent $8.2 billion on power wheelchairs and motor scooters since 1999. It is impossible to know how many of the 2.7 million people who received chairs paid for by the government had true medical need. The Post suggests that the “golden age” of wheelchair scams has passed. Despite the institution of more stringent controls, our medical fraud law firm would question that assessment. Just last week, California news station KUSI reported on the sentencing of a former California doctor in a medical equipment fraud case. Jason Ling, who pled guilty to federal and state charges and whose license to practice medicine has been revoked for at least 10 years, will spend four years in custody and be required to repay close to $1.5 million to both the state and federal government. According to his guilty plea in the federal case, Ling used a “street-level marketer” to find patients for his Southern California medical practice. Even when patients were healthy, Ling would bill for office visits and prescribe unnecessary power wheelchairs and other equipment. Ling pled guilty to charges in both federal and state courts. Whistleblowers’ Law Firm Fighting Medical Equipment Fraud Medicare equipment fraud misappropriates money from already strained health care budgets. Sadly these schemes hurt those who genuinely need to equipment by casting their requests in an uncertain light. Medicare fraud lawsuits help return money to already strained health care programs. These suits often rest on information supplied by company insiders who see and object to the fraud or even the report of individual Medicare beneficiaries who suspect something is amiss. If you have witnessed medical equipment fraud, including but by no means limited to power wheelchair scams, call our office. As a lawyer for medical equipment fraud whistleblowers, Attorney Brod works to fight fraud while also ensuring these brave individuals are protected from retaliation and, if money is recovered as a result of their involvement, fairly compensated for their efforts.